On the coast just south of Waldport, travelers are occasionally relieved to find a functioning restroom. 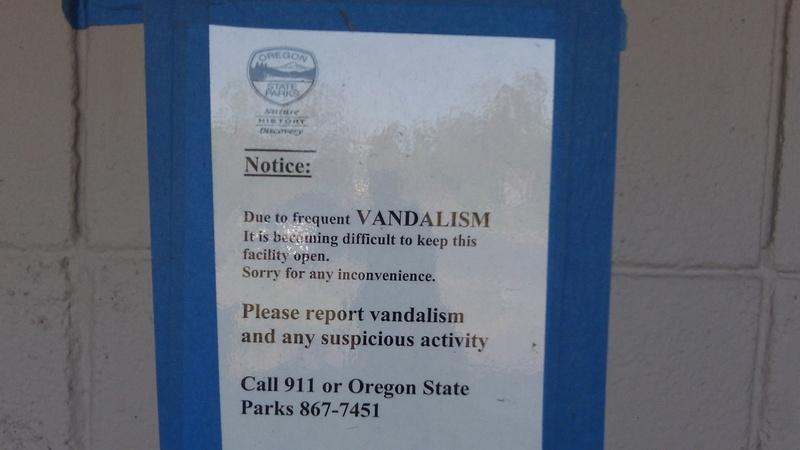 Lately, they also find a sign posted by the Oregon Department of Parks and Recreation. 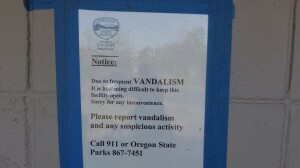 The sign warns people that the department is having trouble keeping the restroom open because of frequent vandalism. It urges the public to keep an eye on the place and report anything amiss. The stark implication is that if the destruction doesn’t stop, that restroom may be closed. As everybody knows, public restrooms are a target often favored by mental midgets bent on destruction of property they do not own. It may be hard to believe that among our fellow beings on this earth, there are some who get their kicks by kicking toilets or breaking sinks. But we know from experience that there are such people. I shudder to think what atrocities they are capable of — and possibly even committing — when they are not busy destroying lowly loos.